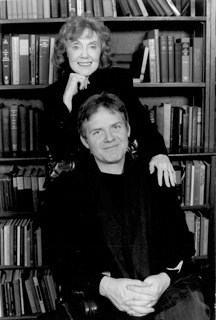 Let us now praise the Irish Repertory Theater, New York, and congratulate founders Charlotte Moore, Artistic Director, and Ciarán O’Reilly, Producing Director, as they receive the 2011 Eugene O’Neill Lifetime Achievement Award from Irish American Writers & Artists, Inc. Since 1988, in production after production, Charlotte and Ciarán have gathered audiences around the hearth at 132 W. 22nd Street to hear the seanachie intone Fádo and enter the sacred space of connection. It was when Charlotte met Country Cavan native Ciarán O’Reilly that the dream of telling the story of the Irish and Irish American experience through theater was born. “In 1980, we were appearing together in Hugh Leonard’s Summer, directed by Brian Murray, who is a very important member of our company now,” Ciarán says. “I had just come to the U.S. from Dublin. Where I’d spent a year at the Abbey Theater playing, for some reason, characters who spoke in Irish. I’d also been acting at the Focus Theater there. I began getting roles in New York at the Irish Arts Center and other theaters when Brian cast me,” he recalls. “Charlotte and I talked about doing Irish plays, but it wasn’t until 1988 that I produced The Plough and the Stars, with Charlotte directing.” It was their first production of many. So Charlotte and Ciarán had the dream, the understanding, the commitment, but how did they manage to make it all come true? “When you work very, very hard and do your best, things happen,” Charlotte says. Ellen got to know the Rep soon after she met husband-to-be, Frank McCourt. “He was playing a teacher in Philadelphia, Here I Come! with Charlotte directing.” The New Yorker called the production by the then one year-old company “better than flawless.” Ellen found herself part of a new family. “Wonderful gatherings, and everyone doing their party piece – Pauline Flanagan, Terry Donnelly and Ciarán Sheehan all became close friends.” Donnelly and Sheehan would join Rusty McGee, Malachy McCourt, Frank McCourt, and Ciarán O’Reilly in what was meant to be a one night’s presentation of Frank’s take on The Irish… and How They Got That Way. “Frank had a shoebox full of notes on Irish American history that he thought could become a theater piece,” Ellen says. “Charlotte shaped it. They added songs and did the show as a one-night-only fundraiser for the Rep.” Audience response convinced Charlotte and Ciarán to expand the show, and now the Rep has presented four productions of The Irish… And How They Got That Way, as well as licensing it to theaters across the country and presenting it on public television. The warmth Ellen expresses toward Charlotte and Ciarán is echoed and amplified by the members of the Irish Repertory Company and the entire theater and theater-going community. The Rep’s annual fundraising galas have become occasions for expressing this high regard. From the first of these evenings, when Katherine Hepburn took center stage to read from Yeats, through concert performances of classic musicals such as Brigadoon, some of Broadway’s and Hollywood’s greatest stars have lent their talents in tribute to the Rep. In this year’s Camelot in Concert, Jeremy Irons starred as King Arthur, with an outstanding cast drawn from the Irish Rep Company, while a 100 voice chorus and an orchestra of theater’s best musicians – all volunteers – filled the stage. Ciarán narrated a Camelot honed to its essence, which Charlotte had adapted and directed during just four days of rehearsal. The result: a standing ovation from the 1,000-plus audience at the Schubert Theater. Over the years, the Rep has also showed a special dedication to the work of Eugene O’Neill. “Anyone who delves into O’Neill’s plays knows they come from a mind and soul of an Irish person,” Charlotte says. When the Rep follows its searing production of O’Neill’s Long Days Journey Into Night with that lighthearted Take Me Along based on O’Neill’s Ah Wilderness, they’re expressing something about O’Neill’s Irish soul, and ours – sunshine and shadow, George M. Cohan and Samuel Beckett. At the dinner after Camelot in Concert, I listened as Tony Award-winner Brian Murray, who played Lord Pellinore, spoke to Jacob Clemente (star of Billy Elliot), who portrayed the young page Thomas of Warwick, who is entrusted with the story of Camelot. He talked about his own days as a child actor who left South Africa at 13 for the London theater. “I knew I was happier on the stage than anywhere else,” Brian said. Jacob nodded. And I thought that the Rep itself is a kind of Camelot – a place of happily ever aftering.